Pictured left to right are CMN team, Jessie Doggett, Christina Clifton, Georgia Drug Card team, Joy McAdams and Clyde Richardson, CMN team, Raigan Johnson. 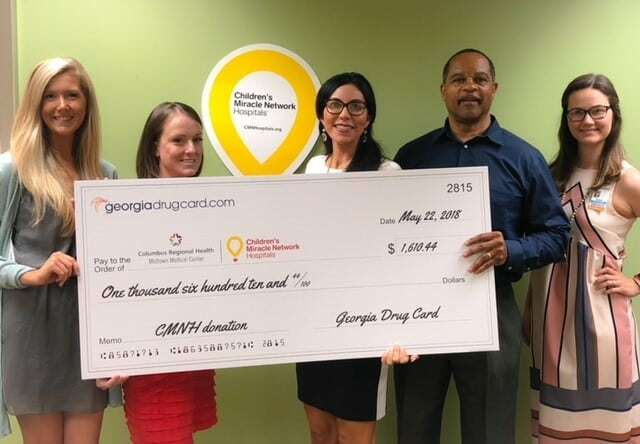 Georgia Drug Card presented a donation to CMN directors Christina Clifton and Jessie Doggett at Piedmont Columbus Regional Hospital Midtown Medical Center on May 22, 2018. This hospital services 21 counties and they have the areas largest level 3 neonatal intensive care unit. Phase 2 of the NICU renovation should be completed this summer. Georgia Drug Card will help provide life-saving care to the children in our community in addition to helping residents of Georgia save money on prescription drugs. A donation will be made to your local CMN hospital each time a prescription is processed using the Georgia Drug Card. Since 2015, the United Networks of America partnership with Children’s Miracle Network Hospitals has raised over $2.4 million dollars for local children’s hospitals. Of this, $1,610.44 has been raised for Piedmont Columbus Regional Hospital Midtown Medical.